If you want to win the ugly Christmas sweater contest at your holiday office party this year, don't limit yourself to tops. These knit sneakers from Brooks are the perfect addition to whatever tacky outfit you plan on wearing to this month's festivities. According to Insider, the ugly sweater shoes act as functional running footwear no matter what time of year you wear them. But the design means you can sport them during the holiday season even if you're not exercising (or if your exercise only consists of last-minute gift shopping). The outside is decorated with a red, white, and green knit pattern of reindeer and evergreen trees, and the inside is printed with snowflakes. There's even a pair of tiny sleigh bells attached to the candy-striped laces. (Don't worry—if the jingling starts to bring out your inner Scrooge, you can remove them). 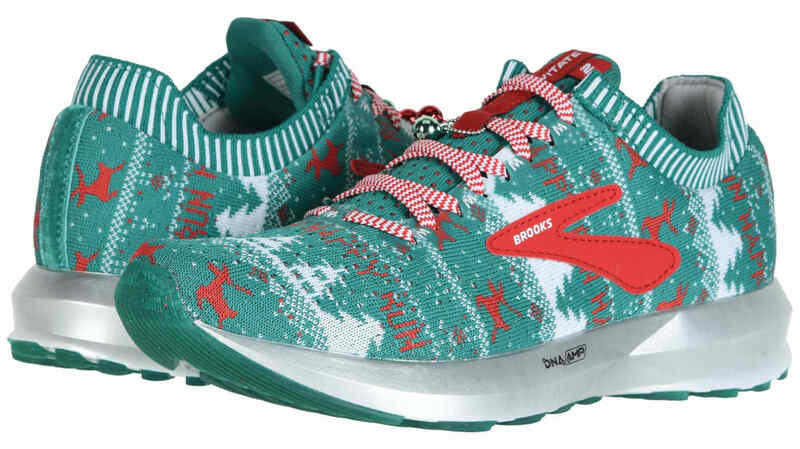 The ugly Christmas sweater shoes are available in men's and women's sizes through both Brooks and Zappos for $150 a pair. If you're looking for more corny knit apparel to complete this year's holiday outfit, you have plenty of options to choose from, including sweaters adorned with llamas, dinosaurs, and Ninja Turtles.